It’s been an awesome end to 2018, and after a record-breaking December (the best one ever for Franco’s Barbering Lounge’s trading history of over 30 years) we thought we’d use the blog to highlight a Day in the Life of the best barbers in Bristol. It’s a bold statement to say that we’re the best barbers in Bristol, but our clients simply love us and the work being delivered by our expanding team of barbers in the Gloucester Road salon. To see some of our amazing client reviews for 2018 and 2019 so far, please visit here. During December, we sold an incredible amount of men’s hair products and male grooming products, with clients looking to our fully-stocked ranges of American Crew, EVO, TIGI B for Men, and Triumph & Disaster to grab great gift ideas as well as treating themselves to the best hair products available. Our team of barbers in central Bristol has been growing in 2018 and is stronger than ever with John, Paola and Tom making a massive impact on our men’s hair salon and clients loving their work in a short space of time. Charlie has completed his Apprenticeship and is running his own column, while George and Lily are learning new skills every day. Franco, the salon’s Master Barber and Founder, is taking one less day per week on a column to spend more time mentoring the growing team. As we head into 2019, we’re also opening late four nights per week including until 8pm on Thursday to cope with increased demand, and Sundays are rapidly becoming one of our busiest days of the week. The average day at our central Bristol men’s salon includes detailed hair consultations for clients, all kinds of creative cuts for men, male grooming services, as well as hints and tips on the best men’s hair products to use. We’re also working on a new website for 2019, which will be unveiled later this year, and our social media platforms provide regular updates on the hottest hair trends for men, as well as exclusive men’s hairdressing offers. To book online and guarantee a time and slot for your next visit with no waiting time, please visit here. 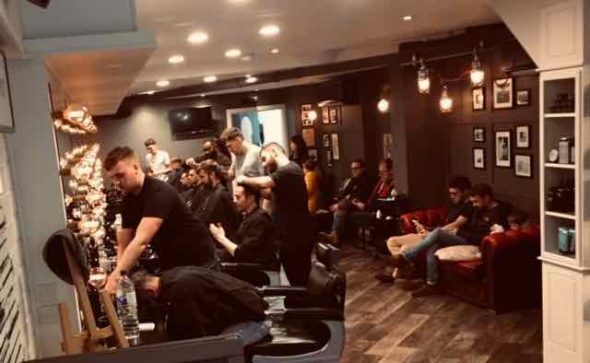 To keep up-to-date with the latest men’s haircuts and male grooming from our team of experienced barbering team on Gloucester Road, please visit our barbering blog here. To find out more about the best barbers in Bristol, contact us here.